Cornell directed or supervised travel: Mission-related travel that is sponsored or supervised by Cornell and for which Cornell exercises oversight. 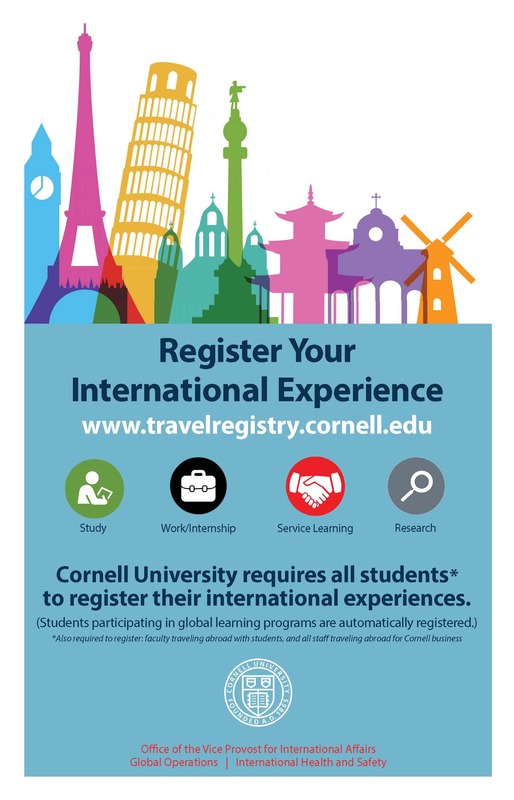 E.g., IARD and Global Health, Cornell study abroad programs, athletics/music-related travel, faculty or staff traveling internationally on university business. Cornell facilitated or supported travel: Student travel over which Cornell University exercises no oversight but that may be funded by Cornell. E.g., international study through another university or organization, approved exchange programs, co-ops or internships through CU departments, or Cornell-funded travel such as Cornell Commitment, OCOF and other travel grants. Non-Cornell travel: not related to Cornell business or programs. E.g., independent student organization travel, personal travel. Cornell Policy 8.5 also clarifies responsibilities of the various offices and roles regarding international travel. Review the policy to understand traveler responsibilities, business purpose, allowable expenses, reimbursements and more. During national higher education week of action, April 29-May 3, Cornell is advocating for the Dream and Promise Act. The Cornell China Center announces eight awards for Innovation in China to interdisciplinary teams of Cornell faculty. Library exhibit examines how world travel imagery transmitted geographical knowledge during the 19th century. The plan: residents would create work synergistically in relation to one another, the house, and the natural elements of the location.